HOUDINI Review | Warped Factor - Words in the Key of Geek. There are some real life stories that make for as great of a movie as a work of fiction does. These incredible larger than life tales make for great biopics, and give the public keen insight into these mysterious public figures. These stories often help the public to get an appreciation for the celebrity as an ordinary, everyday person, and not just as some untouchable figure whose life seemed like a circus. Houdini is a sparsely entertaining, eye opening spectacle that is an embellishment of the life of Erick Weiss, who was known the globe over as the world’s greatest escape artist, Harry Houdini. The film stars Adrien Brody (Predators), Kristen Connolly (The Cabin in the Woods), and Evan Jones (A Million Ways to Die in the West). The movie debuted on the History channel as a two-part event, and made its way to home video not long after. Based on the book Houdini: A Mind in Chains by Bernard C. Meyer M.D, the film details the life of the great escape artist from his time as a child to his untimely death. It gives great insight into his existence as it breaks down the illusion of his great escapes. We see a connection between Houdini and the United States secret service, when he is depicted as an espionage agent (as well as being the famous escape artist that he is widely known as). The film’s biggest flaw is that despite it supposedly being a biopic, it falters as it only grants a superficial perspective on his life. Much of the story feels rushed as most of his private life is quickly whisked through to showcase the spectacular escapes and the circumstances that surrounded them. In spite of that glaring shortcoming, it really delves into the acts of Houdini. This film tears away the illusion of his skill for being a great escape artist and shows the once great death defying feats to be more of a con than actual escape. The way the film breaks these down is nearly worth the cost of enduring the shortcomings. 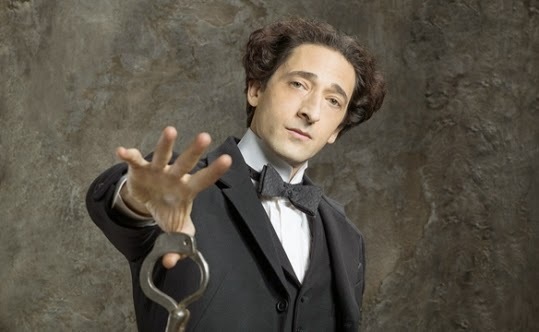 Adrien Brody delivers a decent performance as Houdini, it may not be his Oscar quality performance that he has delivered in the past but Brody is as believable as ever. He is passionate, but lacking, largely because the story never gives enough of the characters private life for Brody to really delve into the role and unleash. The other members of the cast are decent but none really are afforded the opportunity to shine because the film really just focuses on Houdini. Overall, Houdini is a great case for what I call “trailer seduction”. Don’t get me wrong, it’s a decent film, however, the trailer makes it appear so much more appealing than it actual is. If you know little to none about the late, great Houdini then this movie will surely give you some keen insight, but if you are a fan then this film will literally take your appreciation of the death defying defeats a notch or three. All in all, it’s a good film to offset a boring night but let’s hope that someone out there decides to make a true biopic about one of the most intriguing personalities of the 20th century.